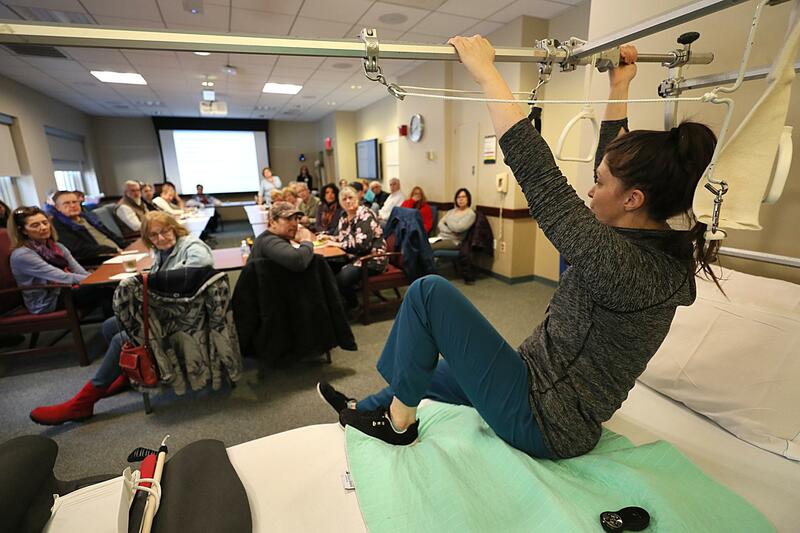 Therapist Caitlin Abusamra showed joint surgery patients how to get out of bed. For a generation that pounded its joints doing aerobics, running marathons, and carving up the ski slopes, it’s time to roll out the spare parts. Take Elliott Francis, 64, who had his second hip replacement surgery in February. Growing up, he was “a jumper and a rebounder,” he said, scooping basketballs off the rim during Roxbury pickup games and later playing in high school and college. Hip replacements in the United States more than doubled between 2000 and 2014 — from 160,282 to 371,605 a year — according to the most recent data from the Healthcare Cost and Utilization Project, which tracks hospital discharges. Knee replacements increased at an even faster clip in the same period, from 274,467 to 680,886. The procedures can cost up to $50,000 for knees and $40,000 for hips, though the prices vary widely among Medicare and private insurers, which typically bear the bulk of the cost. 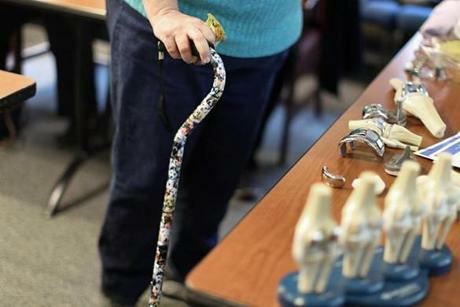 The average age of patients listed in the American Joint Replacement Registry is about 66. With millions more boomers still in their late 50s and early 60s, the trend will only continue. “They’re aging, they’ve had some injuries, and they want to continue to be active into their 60s, 70s, and 80s. And they need a good joint to do that,” said Dr. David Mattingly, surgeon in chief at New England Baptist Hospital in Boston, one of the nation’s top orthopedics centers. A patient looked at joint replacement models. The surgical surge has created an expanding brigade of bionic baby boomers whose artificial parts are accompanied by sky-high expectations — something doctors struggle to manage. Despite steady improvement in technology and outcomes, replacement joints don’t create superhumans. Still, many patients are lifelong fitness buffs who begin plotting their return to the gym, the golf course, or the cross-country skiing trails the moment they are discharged from the hospital. For those who are still working at physically demanding jobs, there are other considerations. Like Smith, many boomers endured months or years of pain before surgery, pain caused by “bone-on-bone” friction when cartilage deterioration eroded their bone cushioning. Some took multiple cortisone shots, hoping to avoid surgeries. But having had the procedures, many say they wish they’d done it sooner. West Newbury’s town clerk, Mike McCarron,, 62, played high school and college football and once climbed Mount Washington in the winter. McCarron underwent two knee replacements simultaneously in 2011. “I had a coupon,” he joked. Now he runs on the treadmill at his Merrimack Valley gym and hikes in the Maine wilderness. Susan Nadworny, 61, of Melrose, owned an aerobics studio in Boston’s North End during the 1980s and 1990s. There, she spent three or four hours a day leading high-impact exercise classes. Nadworny, who now works as a public policy advocate for people with disabilities, had knee replacement surgery last April. Nearly a year later, she pedals an indoor exercise bicycle and spends an hour a day walking dogs in the woods. The vast majority of joint-surgery patients report much less pain and greater mobility afterward, with success rates topping 95 percent, according to the American Academy of Orthopedic Surgeons, a physicians organization. In patient-reported surveys, some still complain of pain and tissue inflammation after their procedures. Smaller numbers suffer serious complications, ranging from blood clotting to hospital-acquired infections. At New England Baptist, a physical therapist showed patients about to have joints replaced how to use crutches. New England Baptist expects to perform a record 7,000 knee and hip replacements at its Mission Hill campus this year, a nearly sixfold increase from the 1,200 annually it did in the mid-1980s. “Most of the busy guys do 15 to 20 a week,” Mattingly said. Last year, the average salary for joint-replacement specialists topped $575,000, reported the Dallas consulting firm Merritt Hawkins & Associates, compared with just over $230,000 for family doctors. Because of improvements in materials and the way they’re treated and sterilized, implants — which include polyethylene and titanium alloys — don’t wear down as fast as they once did. Implants now have a 90 percent chance of lasting two decades, much longer than in the past, Mattingly said. While physical activity obviously plays a role in joint deterioration, genetics may be the biggest factor in determining who needs a replacement and when, he said. Knee replacements were first offered in the 1960s, and hip replacements began in the 1940s, so many boomers are facing the same surgeries their fathers and mothers underwent. But boomers may have a tougher time coming to terms with the reality that a new body part doesn’t mean they can resume all of the high-impact activities that were a major part of their lives. Technology could eventually change that. Joint implants have become more customized to suit individual patients, but a Billerica company is pushing the personalization trend further. ConforMIS Inc. uses 3-D printing and imaging software to more precisely tailor replacement joints. It sells between 17,000 and 20,000 personalized knee implants a year — still a small share of the market — and last year won US regulatory approval for its first hip implants. Stephanie Donvan, 60, of Arlington, who received a ConforMIS knee replacement in May, recalled feeling like she was “carrying a dead tree trunk” before the surgery.